SHANGHAI - Seven years after the first Chinese Grand Prix in Shanghai, Chinese driver Tung Ho-pin is still knocking on doors to become a Formula 1 race driver. The Dutch-born Tung, who has been re-signed as a test driver by the Lotus Renault GP team, still faces his biggest stumbling block - financial support. Zhan Guojun, vice-president of the Federation of Automobile Sports of China, said: "There are only about 30 F1 drivers a year and it is hard to say when China will have an F1 driver or an F1 team. "It depends on whether any Chinese company is interested in fielding a team and offering a driver's seat to a Chinese." Last year, Tung became a test driver for Renault, making him one of only a handful of Chinese to join an F1 team. The 28-year-old was one of many drivers signed by Gravity, a management group under Genii Capital, which bought a 75-percent stake in Lotus Renault in 2009. 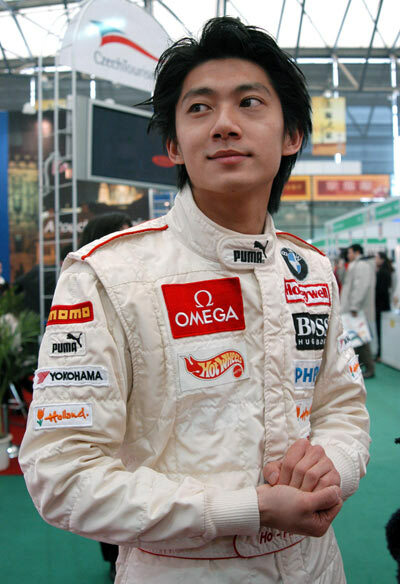 Tung rose to prominence in 2004 when he was awarded an F1 test drive with BMW-Williams after his landslide victory in the Asian Formula BMW Championship - the first Chinese to claim that honor. After that, Tung, who started racing at 14, performed well on the ATS Formel 3 Cup circuit from 2004 to 2006. He won the championship in 2006 after coming in third in 2005. In 2007, he moved up to GP2. "My experience, my general speed and my knowledge about the car have improved in recent years," said Tung. "I learned a lot about car technology. Just the whole package as a driver, I've learned a lot." Tung has gained glory for China, the flag under which he races. In 2007, he gave China its first podium finish in the A1 Grand Prix series, coming in third at the A1 Grand Prix of Nations held at the Eastern Creek raceway in Sydney, Australia. Tung remains a test driver for the Lotus Renault GP for the second consecutive year - something that Tung is delighted with. "It shows that the team principals have great confidence in me and my skills," Tung said. "I'm proud to belong to such a prestigious and legendary team. Look at the beautiful uniforms." The Federation of Automobile Sports of China's Zhan said having a local F1 driver would require a team sponsored by local companies. At present, some Chinese companies have latched onto F1, such as IT companies Aigo and Lenovo, whose logos appear on F1 cars. But none of them have decided to field a team. "But holding the event in Shanghai has drawn more attention to motor sports," Zhan said. "During the first event, in 2004, 120 of the world's top 500 companies were involved either directly or indirectly. "At that time, China held about 30 motor sport events a year; now the number is about 100 a year." Zhan said he knows that many companies are considering being more involved in F1. "But it's hard to say when this will be realized." But for Tung, making further progress for his second year with Renault is his top priority at the moment. "Whenever you experience a milestone in your career, I think you always take it step by step. I think every time you reach a new level, you set yourself a new goal," Tung said. "That's difficult not only for racing drivers, but also for sports people in general. They are probably never satisfied with the things they've achieved, but are always looking forward to the next goal. "I hope in the very near future, I will be able to represent the Chinese audience in F1." As the only ethnic Chinese driver in the sport, Tung always draws attention from Chinese motor racing fans. To better satisfy his Chinese fans, Tung started his official Chinese website last week on one of the country's leading portals, sohu.com. "I know I have a lot of supporters in China and I hope one day I can return their support and make them proud of me," he said.